If you can’t explain it simply, you don’t understand it. Albert Einstein’s quote might be the idea behind the Science Magazine and AAAS-sponsored “Dance Your PhD” contest. The idea is for PhD candidates to visually interpret and explain their dissertation research. There are now years of submissions: some funny, some beautiful, some art-house-worthy, but all about research and sciences. So why leave the fun to graduate students? As part of advocating science literacy in my classroom, I have my 10th grade Honors Chemistry students dance their first semester final. 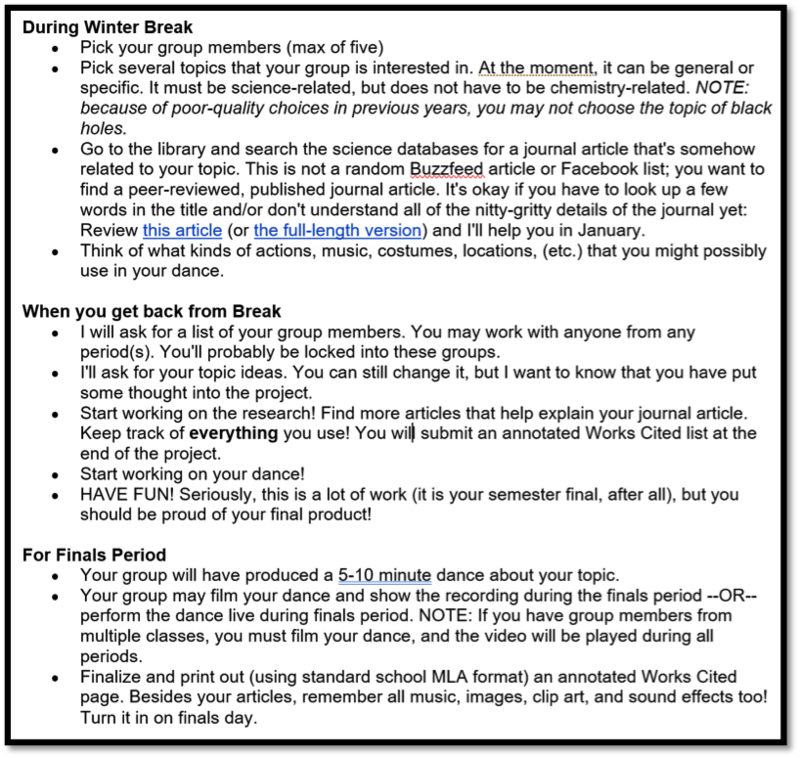 This Dance Your Final semester final is to force students to actually read real, published scientific research; have a group final; eliminate test anxiety; and help students have fun with the content. Truly, of all assignments I give during the school year, this is the one that students say they sweat the hardest on, enjoy the most, and are the most proud of their work. Unlike the PhD version, students do not have to do their own research or experiments. Instead, they find a published, peer-reviewed article on a science-related topic and rhumba, pop-n-lock, mechanically-robot, lyrically ballet, or otherwise rhythmically explain. Fortunately, our library and librarian (and public library system!) are amazing, and we have a lot of databases and resources. Really, my students’ problem is choosing a topic from seemingly esoteric scientific titles and abstracts. I give them very little homework during the year anyway (a topic for another day), but I consider this assignment their homework for about three weeks’ time (after Winter Break until Finals period). This final is a lot of work for students. In the past, I haven’t distributed an official schedule, but during class, I do offer periodic verbal descriptions of where I think their progress should be. Figure 1 - Readers can find a downloadable version of this student document under Supporting Information. Nearly all of my students choose to film their dances. If you intend on doing this kind of assignment, I recommend that students either submit a secured YouTube or Vimeo link, or post the video to a secured site. I also lay some ground rules (listed on our Learning Management System), including that they may (or may not) use costumes and props, have a narrator, use subtitles, play music or sound effects, use images, film different scenery, etc., as long as the science of the article is communicated clearly to classmates and me. I have seen beautiful lyric dances about the science behind dejá vu, a PSA-style movie about concussions, walking paths through multiverses, backflipping exploding stars, modern dance illustrating Elizabeth Blackwell’s life, and an analysis about memorization of patterns. Readers can find the list of ground rules and a rubric I use for grading the performances in the Supporting Information below this post. Enjoy the science!